I left work early with the hopes that I could find some pre spawn bass on a lake the I pretty much grew up on. I remember the first “big” bass that I ever caught at the age of 5. 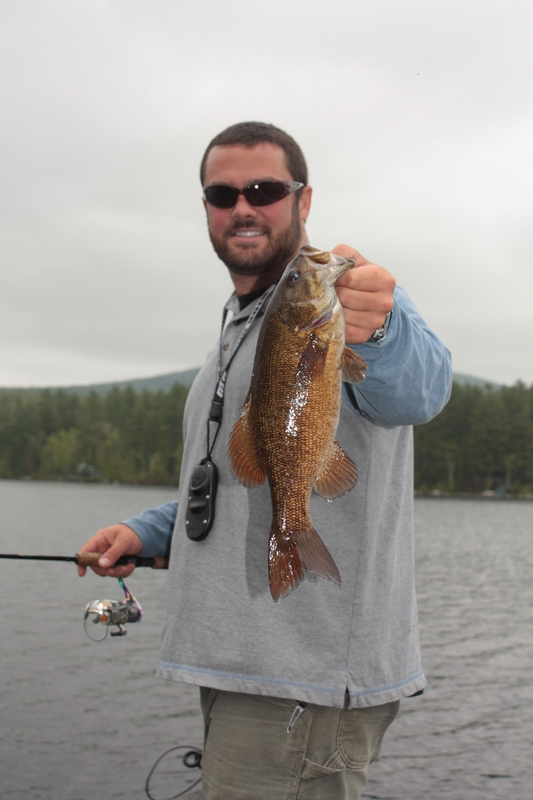 It may not be big by my standards today but that 15″ smallmouth was probably the best one I ever caught. I spent countless hours on the dock after that waiting on another one. That is where my addiction began. When I was old enough to take the boat out, my opportunities really expanded. I learned a lot about the lake and how these fish move throughout the year. Being spring time, when it’s on, it’s on. In the past, I have never used temperature gauge to help find them but now that I have the capabilities to, I will! Upon my arrival, the water temp was 61.8 on the windblown shore where the launch is located. 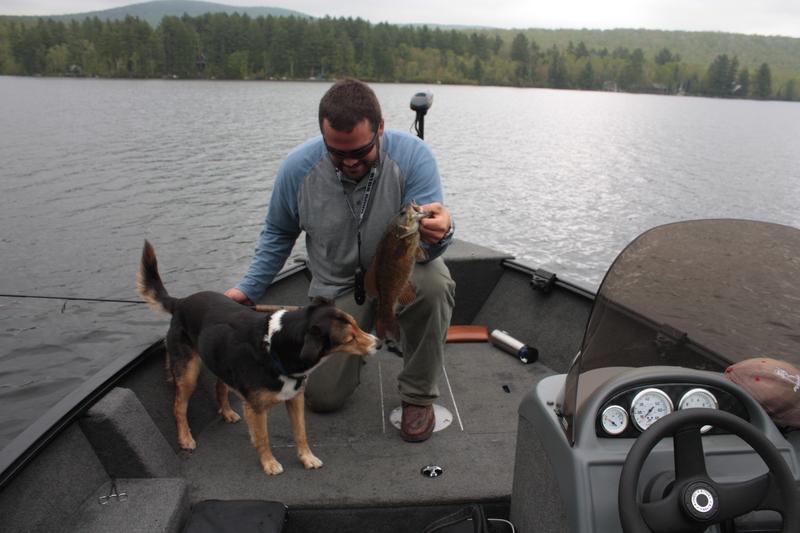 We motored up to where I like to start fishing when the wind is out of the north west. Finding a cooler temperature, I got out my rod and started casting. I was looking for sheltered coves so that I could escape the constant wind. I was thinking that we would find these fish off shore and hugging structure but it was actually closer to spawn conditions. I started pounding the likely areas that these fish like to build beds. Mainly, I was looking at every nook along shore. Rocks tend to be the best locations with casts placed on both the wind blown and sheltered side. On a good year, it is likely to catch a fish every few feet but that last couple of years, there has been a movement from the larger fish to slide deeper to spawn. Now I have identified a few flats that the fish like to set up on where the bottom is not visible, it is just a matter of time until they are present. After working a few miles of shore line over the course of a few hours, I had put 18 bass in the boat as well as a few pickerel. 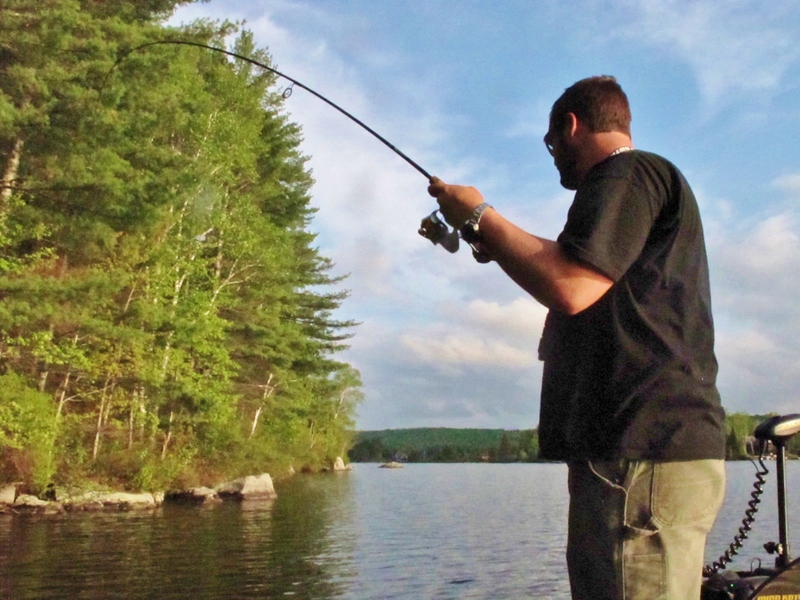 The bass were on clean bottomed areas and it didn’t take long to figure out what areas to avoid for the pickerel. The pickerel were relating to anything weedy with reeds being the worse spot to cast near. With all this just beginning, this long holiday weekend should produce some good numbers as long as the temperature stays warm!